· Indian Research Institute for Integrated Medicine (IRIIM), Howrah, a registered society established in 1981 by a group of social conscious young medicos, researchers, health & social workers. · This initiative was in continuation of great humanitarian spirit of late Dr. Bejoy Kumar Basu (Doyen of Acupuncture in India) & Dr. Dwarkanath Santaram Kotnis - both members of the historic 5 member Indian Medical Mission to China (1938-1943). · Health is really a multidimensional phenomenon. Therefore, integrated medicine attempts to respond to the challenges of health in at least four discernible but interdependent levels - social, philosophical, cultural & economical. · It is, therefore, inherently multidisciplinary in nature embracing such subjects as ecology, sociology, economics, social anthropology, all branches of the natural sciences and medical science proper. To the extent that the science of integrated medicine is an emerging and frontier field, the scope of work on integrated medicine is yet to be fully defined and articulated. 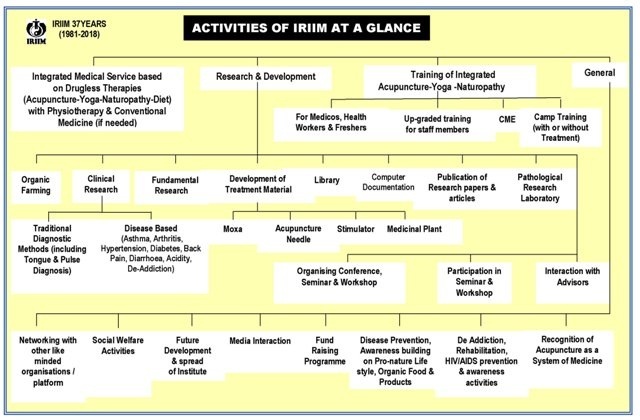 · IRIIM is pioneering the study of integrated medicine in India in a conscious way and towards this end IRIIM is keen to develop fraternal relations with any individual or organization in this country or abroad willing to work towards the betterment of the quality of life. · Treatment, training, research & awareness generation activities on drugless pro nature therapies like Acupuncture-Yoga-Naturopathy-Naturopathic Diet (basically Organic) and Integrated Medicine. · As a Not For Profit voluntary organization, IRIIM serves the common people at an affordable expenses both at Outdoor and Indoor (which is only in Eastern India). · Training, Consultancy and Awareness generation to Medicos, Health-workers, Students, Corporate, Voluntary Organisations etc. · Fund Raising for all such activities as IRIIM is dependent on nominal donation from services rendered, donations from well wishers and occasional grant-in-aid from Govt. or Non Govt. bodies. · Since 1981, treated more than Lac patients at Dr. Ranajit Memorial Hospital & Acupuncture-Yoga-Naturopathy College of Research under IRIIM. Developed integrated treatment protocol based on standard guideline of Acupuncture-Yoga-Naturopathy and Diet in different disease conditions. · Since 1993, conducts De-addiction program (earlier under Ministry of Social Justice & Empowerment, GOI) with special emphasis on drugless Pro Nature therapies. More than 5000 addicts have been detoxified and rehabilitated. · Research Advisory Board (RAB) of IRIIM comprising a team of experts from different fields under the Chairmanship of noted Defence Scientist Prof. Dr. Ram Gopal guides the R&D work of IRIIM. IRIIM stresses on R & D work in day to day practice for standardization of traditional drugless therapies. For example, as a routine procedure, IRIIM faculties observe traditional tongue and pulse examination both for diagnosis and prevention purpose. It regularly conducts research studies on traditional diagnosis and comparative efficacy of drugless pro nature therapies with conventional one, completed 6 major research projects sanctioned by Govt. of India under ICMR, DST, DIT, DRDO, CCRYN. · Since '90s, closely associated with AYUSH, CCRYN & NIN, Pune under AYUSH, GOI; Regular participant of National Arogya Fair; Resource Organisation for AYUSH consultation and Natural Food Stall aided by CCRYN in National Arogya Fair in Kolkata and Guwahati. · Under National Rural Health Mission (NRHM) of Govt. 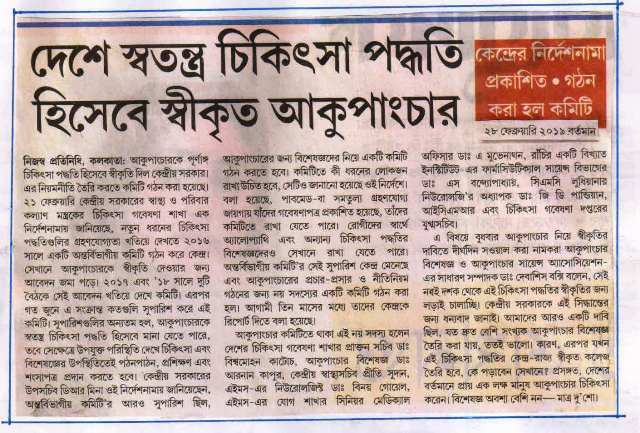 of India, IRIIM conducted Research Survey on Traditional Medicine in two States (WB & Tripura) out of 21 States in 2008. Report published by GOI. · More than 2500 Medicos & Freshers from India and neighboring countries are trained in Integrated Acupuncture- Yoga-Naturopathy. Training is also conducted regularly at Kerala and other states. · Collaborating with traditional healers of USA, Australia, China, Nepal, Pakistan and Bangladesh. · IRIIM Faculty presented more than 180 scientific papers in different National & International seminars, conferences, workshops etc. and chaired technical sessions. · For more than 30 years, IRIIM has been working on the Recognition of Acupuncture, Alternative & Traditional Systems Medicine (ATSM) & its inclusion in health care delivery and accordingly prepared & presented several scientific documents to different Ministries and Parliament also. · Closely associated with International Naturopathy Organisation (INO), SVYASA Bangalore, Dev Sanskriti Viswavidyalaya Haridwar, Swasthya Sadhana Kendra Jodhpur, Indian Institute of Engineering Science & Technology (IIEST), Shibpur, Howrah, West Bengal, North East Institute of Science and Technology (NEIST) Jorhat, Assam. · First time in India, State Govt. sanctioned grant from District Plan Fund for constructing initial portion of the Indoor Acupuncture Hospital run by IRIIM. · IRIIM grows and propagates common medicinal plants, organic vegetables and fruit, recently Rain Water Harvesting project also implemented in IRIIM campus. · Head Office of Acupuncture Science Association (ASA) India. To undertake research works to establish the mechanism of action of Acupuncture therapy and to evaluate its effectiveness singly or combinedly with other therapeutic systems (i.e. Allopathy, Homoeopathy, Ayurveda, Naturopathy, Unani, Yoga and Physiotherapy etc. ), in order to develop an integrated Medicine for having maximum benefit for the suffering humanity. To practice different therapies singly and combinedly and to evaluate their effect scientifically. To undertake and organize research programmes with a view to delivering the effects of therapies to the common people at large with simplest and common form. Health is really a multidimensional phenomenon. Therefore, integrated medicine attempts to respond to the challenges of health in at least four discernible but interdependent levels - social, philosophical, cultural &amp; economical. It is, therefore, inherently multidisciplinary in nature embracing such subjects as ecology, sociology, economics, social anthropology, all branches of the natural sciences and medical science proper. To the extent that the science of integrated medicine is an emerging and frontier field, the scope of work of integrated medicine is yet to be fully defined and articulated.